In this chapter, I tested and validated the “ThimbleSense” system, a new wearable individual-digit force/torque sensor developed and presented by Battaglia et al (Thimblesense: an individual-digit wearable tactile sensor for experimental grasp studies, 2014 IEEE International Conference on Robotics and Automation (ICRA), 2728–2735 (2014) ). This system aims to integrate the grasp analysis achievable with sensorized objects presented in the Chap. 2 where the position of the contact surfaces is fixed. ThimbleSense allows to obtain measurement of contact forces between hand and grasped objects without constrains on the hand postures. The main advantage of this approach with respect to more conventional solutions is the possibility of being versatile without losing accuracy: instead of building many sensorized objects for different experiments, it is possible to employ ThimbleSense to study grasps of a variety of objects, while still retaining the complete force/torque measurements. Unfortunately, ThimbleSense rigid shells are interposed between the fingertip and grasped object. This inevitably modifies the physiological mechanical deformation that would otherwise occur at the bare fingerpad in direct contact with objects. An experiment shows that excessive grip forces are attenuated with training as the subjects familiarize him/herself with the ThimbleSense. This effect evidences that sensorized object and wearable object are both necessary to investigate different aspects of human grasp. 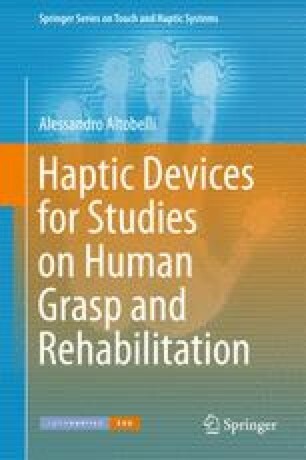 In this work, I briefly introduce the concept and the implementation of individual-digit wearable force/torque sensors; later, I present some experiments to validate the device (Battaglia et al, Thimblesense: A fingertip wearable tactile sensor for grasp analysis (2015) ). In particular, my contributions in this work are: (i) to define a procedure to handle F/T sensor offsets and to estimate the inertial parameters of the device in static conditions and (ii) to validate the measures of the device with some experiments. Results evidenced that internal forces estimated with the ThimbleSense are inside the null space of the grasp matrix.